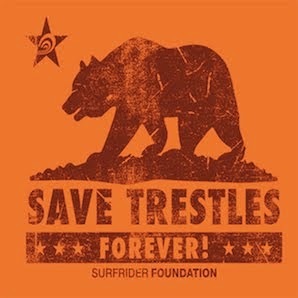 SURFRIDER FOUNDATION BRASIL supports the Save Trestles campaign from the Southern Hemisphere! Click the picture for bigger version. The Save Trestles campaign joins Step It Up 2007 to raise awareness about climate change and the unnecessary 241 toll road extension. Why are the two groups joining efforts? Because more roads mean more cars—and more cars mean more greenhouse gases. It’s that simple. On Saturday, Nov 3, Step It Up is organizing events all around the country, calling for leadership on global warming. From coast to coast, people are gathering. Join Surfrider, and other environmental organizations for a beach cleanup at Trestles. Meet at the Trestles Parking lot at 4pm. Then join us for an after party at WestEdge. We are encouraging supporters to be part of our "Virtual Hearing" by recording a message to the Coastal Commission, telling them you want to Save the Park and Stop the Toll Road. Go to: http://www.youtube.com/group/savesanonofre to learn more! The Coastal Commission hearing regarding the proposal for the extension of the Foothill-South Toll Road has been postponed. Therefore we will not attend the October 11th hearing. The TCA asked for an extension on their application. They say they need more time to digest the Coastal Commission Staff report. That's probably because the staff report found the toll road couldn't possibly be done in an environmentally conscious way, and there was no amount of mitigation that could justify it! In addition, we believe the TCA is back-peddling because they are intimidated by our efforts and recent victories! We beat them in San Diego when the City passed a resolution to protect San Onofre State Park. Then, the TCA continued to falter after a recent poll found 70% of Orange County voters do not support toll roads through State Parks. Plus, the TCA has been receiving bad press, and their newest attempt to throw $100 million at State Parks fell flat. They are stalling—we are prevailing—but your continued supported is more important than ever! Stay tuned for additional updates! We need your assistance in other ways very soon! We will keep you posted on when the hearing is rescheduled. We want to thank everyone who came to the Paddle Out on Saturday. We had a great turn out and this is exactly the kind of event that keeps the pressure on the TCA. Of course, we’ll be planning more visible events in the near future to make sure the TCA knows we are not resting on our laurels! Thanks again for your enormous help in opposing this destructive proposal and your efforts to protect San Onofre State Beach. Oct 6 "Paddle Out" to raise awareness for the Coastal Commission Hearing 10am. In conjunction with the Sierra Club, we are having a paddle at Trestles to raise awareness about the Coastal Commission hearing and the campaign. We want to get a huge crowd in the water to Paddle out and raise awareness. Get your boards ready and waxed. Meet at Trestles Beach, "Uppers" at 10am sharp! No good thing should come easy. After failing to gain the support of the San Diego City Council last year, we went back and spent the last 11 months meeting with each member of the San Diego City Council and presented them with the facts. Then yesterday, by a vote of 6-2, the San Diego City Council voted to adopt a resolution supporting San Onofre State Beach Park and opposing the planned SR-241 toll road extension!! This now means that our efforts to stop the 241 toll road extension and protect our State Park and San Mateo Creek watershed resources are supported by the three largest cities in California: San Francisco, Los Angeles and San Diego, as well as nearly a dozen other cities around the state! Next stop – the California Coastal Commission hearing on October 11th in San Pedro. This is a big one folks!! This hearing will determine whether the TCA’s 241 extension project is consistent with the California Coastal Act. We are asking everyone to take a moment and send one of our Action Alert emails to the California Coastal Commission. Simply click here to send them a message. The Surfrider Foundation has also reserved several motor coaches to shuttle activists from South Orange County and San Diego to San Pedro. If you are interested in attending the meeting (we need all the bodies we can get there folks!) and would like to go up on one of the buses, please email Stefanie at ssekich@surfrider.org as soon as possible! We need you to attend the meeting of the CCC on October 11 in San Pedro. The Commission will be hearing the application to build the Foothill-South Toll Road through San Onofre State Beach. Also, please send a letter to the Coastal Commission asking them to DENY the application. From the Boost Mobile Victory party! The Toll Road won't Help Traffic! Take a look at this map created by the Orange County Transportation Authority. It shows that if it's built, the toll road will be the LEAST used highway in Orange County, while the I-5 will be stuck in gridlock. So tell me how destroying a state park helps traffic?? As we've been saying... It's NOT WORTH IT!! And while you're at it, here's older article talking about this very issue. Be sure to watch the webcast . They've been running some great video interviews with Surfrider activists talking about the toll road. We'll try to get the footage up here in the near future. Mark your calendars now!! The California Coastal Commission will be hearing the application for the proposed toll road in October at a hearing in San Pedro (near the LA Harbor). The California Coastal Commission is a very important regulatory agency that oversees development along California’s coast. Literally, this is one of the most important meetings in regards to stopping the toll road through San Onofre State Park; and we need throngs of people to attend! In order to get people from all over Southern California to the hearing, the Surfrider Foundation and Sierra Club are renting Charter buses. In addition, we will have Save Trestles tee-shirts for everyone, signs/banners, and talking points for people who want to speak during public comment period. Remember, you can still attend the hearing even if you do not testify. Our main objective is to have an enormous presence. Volunteers recently set up a booth at the US Open of Surfing in Huntington Beach and found lots of support to protect Trestles and San Onofre State Beach from the toll road. Our own Stefanie Sekich was recently on the San Diego Air America affiliate. Last week the best school-aged surfers competed here at Lower Trestles in the National Scholastic Surfing Association Championships. The winners, especially in the open divisions, often go on to distinction as professionals. But the future of the waves here is less assured. Many surfing enthusiasts have been fighting a plan to build a toll road nearby that could alter the iconic surf break. Some recent events have been encouraging to the surfers. Work on the road was scheduled to begin in 2008 and expected to cost $875 million, but the project has been pushed back to 2011 because of regulatory hurdles. And in May the House Armed Services Committee passed an amendment to the National Defense Act that forces the Transportation Corridor Agencies, the group that would build the toll road, to comply with state and federal environmental laws. It had previously been exempt. Named for the railroad trestles running over San Mateo Creek, the surf spot consists of five point breaks where waves curl over a cobblestone reef. Lower Trestles is the best, with waves that are not overly large, but with well-shaped shoulders, they are ideal for long, fast rides, and aerials and other maneuvers. “It’s by far the best wave in Southern California,” said Pat O’Connell, a professional surfer who lives in nearby Laguna Beach. Art Farm "Save Trestles" Party this Thursday, June 28th! Don't miss the Art Farm's "Save Trestles" Art Auction closing party, this Thursday, June 28th at the Ocean Avenue Brewing Company in Laguna Beach. And no, you don't have to be good looking to get in ...but it helps! 1. A clumsy social error; a faux pas. 2. A blatant mistake or misjudgment. In the mad scramble to find new spin on a bad project, local TCA supporters seem to be clamoring to make any argument – no matter how far fetched – to scare, confuse or otherwise bamboozle the public into supporting the proposed 241 extension. However, the problem with “making it up as you go along” is that…well….you’re making it up! Actually Sam, the Surfrider Foundation has been based in Orange County for the last 20 years. In fact, our global headquarters are located in San Clemente, just a couple of freeway exits down from your office. Yikes - Not only has Mayor Dahl apparently forgotten about the existence of Pacific Coast Highway, he also seems to have forgotten that it is listed as an official EVACUATION ROUTE on the City of San Clemente’s website! I can almost picture Mayor Harkey walking along the beach at Salt Creek, wishing she could replace the sand with something a little less...sandy! Sorry Peter… We checked with the Community Relations Department of the Orange County Fire Authority, and they assured us that in the event that the I-5 freeway were closed in both directions, there are ample alternate routes to access the facilities at Mission Hospital, and that emergency response personnel were trained to deal with such a crisis. Is anyone else somewhat surprised that the CEO for one of the county’s largest medical centers doesn’t know the contingency plans for his own facility? I’d like to see David Skelly call Dirty Harry stupid to his face! Go ahead, Dave… Make my day! Last month, the U.S. House of Representatives took the first step in leveling the playing field in the growing debate over a six-lane highway coming out of Orange County that would bisect San Onofre State Beach in northern San Diego County. Led by Reps. Susan Davis, D-San Diego, and Loretta Sanchez, D-Garden Grove, the House-passed Defense Authorization bill reverses prior federal legislation that exempts the toll-road project from state law. The prior act was a largely unnoticed and unprecedented end run around the California Coastal Act and other state laws enacted to protect California's natural, historical and cultural resources. Exemptions that circumvent the rule of California law make bad policy, especially when, as in this case, the exempted project has generated considerable public opposition. This project should be subject to the same analysis and environmental review that any other project in the state would receive. "I firmly believe one of the greatest legacies we can leave to future generations is the heritage of our land. This expanse of acreage, San Onofre Bluffs State Beach, now has it's future guaranteed as an official state park." OC Beaches interactive piece by the Register. If you click on San Clemente it brings you to a page with a few photos of SC beaches and a great video completely focused on San Onofre, Trestles and the threats of the toll road. Rich Rozzelle does his usual great job describing the park and the potential impacts. Here’s the direct link to the SC piece. California Coast & Ocean provides a very thorough article on Trestles, San Onofre and the threats from the toll road. Driving north from San Diego along the coast on Interstate 5, a traveler passes mile after mile of houses, malls, businesses, and roadways. Every now and then you glimpse the ocean off in the distance or see a grassy hillside, but otherwise you are confined to a virtual corridor of development. Then suddenly, just north of Oceanside, the landscape opens up. To the west is the ocean, while to the east flatlands and rolling hills covered with coastal sage scrub extend as far as the eye can see, with only here and there a building or a road. Along this stretch of highway you might actually spot a hawk circling overhead, hunting for its meal among the abundant little critters in the underbrush, or perched atop a telephone pole. This is coastal southern California as it used to look before sprawl took over, and it's still here because you're in Camp Pendleton. Like many military reservations in California, this 125,000-acre Marine Corps base, owned by the Department of the Navy, contains some of the last wild land in its region; this area would likely have been developed years ago if not for the base. San Mateo Creek, one of the last coastal streams in southern California that has no dams or other man-made barriers, flows from its headwaters in the Cleveland National Forest through Camp Pendleton to meet the ocean. Southern steelhead were thought to be extinct south of Malibu Creek until they were found in San Mateo Creek in 1999.
challenge for a good cause and I met some great people on the way." Late Wednesday night the House Armed Services Committee passed an amendment to the National Defense Act that included language which now forces the TCA to comply with the same California state laws as other developers in obtaining approval to construct the proposed toll road. The amendment, which was submitted by Rep. Susan Davis of San Diego and supported by Rep. Loretta Sanchez of Orange County, was needed to counter several exemptions from state and federal environmental laws which the TCA had secretively garnered over the past several years. "With these exemptions, the TCA thought they had a trump card in their back pocket, which they could have used to avoid full compliance with environmental laws," said Surfrider Foundation Assistant Environmental Director, Mark Rauscher. "This vote is a victory for protecting park lands everywhere and upholding state laws." Surfrider Foundation and its partners applaud Davis' efforts to level the playing field and we encourage you to let her know your appreciation by sending her a note by clicking here. In other good news word came down late Thursday morning that the California District Court of Appeals had sided with the Surfrider Foundation and other environmental organizations and ruled that a suit filed by the Save Trestles/San Onofre coalition against the TCA for violating the California Environmental Quality Act must be heard in San Diego County (the TCA of course wanted the case to be tried in Orange County). "The ruling by the 4th District Court of Appeals is a clear sign that this issue impacts more than just the residents of South Orange County," said Surfrider Foundation's Matt McClain. "If completed as planned, this toll road project will have direct and adverse impact on San Diegans, and very likely destroy precious resources that belong to the public at large." While these two decisions do not yet represent the final nail in the coffin for the proposed toll road extension, they are two big steps towards that direction! First, this past weekend the CA Democratic Party passed a resolution opposing the toll road through San Onofre State Beach!! This is huge and sets the stage going forward in Sacramento and DC. More details on this later..
Our own Matt McClain took on the TCA spin masters during a recent episode of Theese Days on the San Diego NPR station. They're clearly sensitive to the Most Endangered River designation. San Mateo Creek (which empties into and forms Trestles) is listed as the second most threatened waterway in America by the national environmental group American Rivers in their 2007 Most Endangered Rivers report released today. You can see the report and the specifics on the rivers at their site. San Clemente Times - The Toll Road: Fact or Fiction? Come by the Surfrider HQ in San Clemente to get your sign and show your support for Trestles and San Onofre State Beach!! The future of Trestles is not concrete yet. And for now, its defenders can find strange solace in that uncertainty. It is better news, after all, than most could have foreseen a year ago. In a recent committee meeting, the Transportation Corridor Agency (TCA) announced an unexpected change in plans -- the targeted start date for the 241-Toll Road extension has been postponed from 2008 to 2010, at the earliest. William Woollett, the agency's CEO, explained that the decision was made in light of expected delays in obtaining permits from the US Fish & Wildlife Service and the California Coastal Commission. THE TCA ANNOUNCED THAT IT IS POSTPONING THEIR TARGETED START DATE FOR THE 241 TOLL ROAD FROM 2008 TO AT LEAST 2010 !!! The surprise announcement was made at the end of the TCA’s Operation and Budget Committee meeting by the TCA’s CEO himself, William Woollett. Woollett, along with the TCA’s Deputy Director of Environment and Planning, Macie Cleary Milan cited several reasons for the postponement – notably the three outstanding lawsuits that have been filed by the California Attorney General’s Office, Native American Heritage Foundation, and of course the Surfrider Foundation and it’s coalition partners! Cleary Milan also noted that the agency is expecting delays in receiving permits from both the US Fish & Wildlife Service and the California Coastal Commission. I need not tell you that this is OUTSTANDING NEWS for the SAVE TRESTLES campaign! The longer this campaign drags out, the closer we get to the TCA’s non-compete agreement with Cal Trans running out!! Now the big question is: Which is more likely…the TCA winning approval for the 241 Toll Road anytime before 2020 or Guns n’ Roses actually deciding to release Chinese Democracy? PS – Big shout out to our friends at Dragon Alliance (yeah Checky!) and Ocean Minded (yeah Gary!) for supporting Surfrider Foundation’s SAVE TRESTLES campaign!! Thanks to them, we have brand new Save Trestles yard signs available. Stop by the office and pick one up!! At least according to local Assemblywoman Mimi Walters. Here's her quote from a recent news story: "Gina Zari, spokeswoman for Assemblywoman Mimi Walters, R-Laguna Niguel, said the representative for coastal areas of southern Orange County and northern San Diego County backs the toll road and believes it actually will help the park, by providing money for improvements." In reality construction of the 241 Toll Road Extension will destroy hundreds of acres of the park and close the scenic San Mateo Campground. Click Here to listen to the RealAudio recording of the show. Q: Why do you love the oceans, waves and beaches? These two brothers raised $110.00 for the Save Trestles Campaign by collecting cans and bottles from Jan. '07 to mid Feb. '07. They came by the Surfrider Foundation National office on Feb. 22 to drop off their donation. Local film makers Michael Spencer Taylor and Joe Cheshire are soon to release "Boost to Save Trestles" a documentary on the break and threats from the toll road. Check out his site to see the trailer.. This is a recording from the San Diego Chapter's meeting in July 2006. Here, Todd Cardiff of the Coast Law Group gives background on the toll road, the TCA and why you should lend a hand to save Trestles. And here Brian "Woody" Woodward describes in detail the environmental affects of the toll road at Trestles. Kiwi singer/songwriter and Surfrider Foundation member Daniel Gannaway has written a song to support Trestles. remaining jewels of the Southern California Coast...'"
Jaime Reveles, a local musician and artist, created this really cool free-form multi-media website to support Trestles and inform others of the beauty to be found there. Check it out and start clicking away, there's many pages to explore and almost everything is clickable. Video created by Trestles supporters in the Malibu area. We're gonna try to keep you up to date and informed on what's happening with the Save Trestles Campaign. We expect lots to happen in the coming year where you'll have the opportunity to voice your opinion on the Toll Road with various government agencies including the CA Coastal Commission, the Regional Water Quality Control Board and the Federal Highways Admin. We'll be looking to get large turnouts at public hearings, so you'll get plenty of notice in case you want to take the day off to attend. Expect to see legislation in Sacramento where we'll ask you to contact your state representative to get them to vote to protect Trestles and San Onofre. I'll also be posting videos and artwork created by our supporters. To get started, check out this cool piece below. If you've created something about Trestles, just send it my way and we'll get it up here.